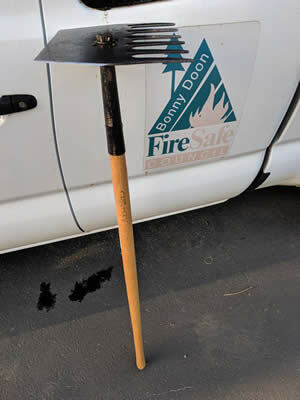 A McLeod fire tool can be helpful to cut quick handlines down to the dirt in preparation for wildfireFor general preparedness for wildfire, follow the recommendations on this CAL FIRE website. Additionally, if you haven’t already, it might be worthwhile to look in to fire insurance plans that would protect your home in the event of fire damage. Additionally, Thermo-Gel is a water gelling agent that, when kept wet, aids in structure protection and fire retardation. Home protection kits can be ordered from a number of entities online and applied before firefighters arrive. Evacuating because of a fire can be a stressful experience. The moments after an evacuation order can be frantic, but if you already have a plan of what you want to take with you, you could save yourself a lot of heartache and stress in the days that follow. Your life and the lives of your family members are far more important than any belonging. What few irreplaceable items, like baby photo albums or family pictures, are most important to you? Have them easily accessible to throw into the car at a moment’s notice and have a plan of what you are going to take. Have a bag of clothes packed and ready. You might not be home for a couple of weeks and it could be comforting to have more than one shirt with you. McLeod fire tools are very helpful to have on hand for cutting quick hand lines down to the dirt.